Hello, dear Reader! It's my first "spring" in California, and I have all kinds of mixed feelings. First I was shocked when, a few weeks ago, I noticed tulips sprouting up from the ground. In early February! And now spring blooms are all around. Of course they're gorgeous, and I love seeing them just everywhere, but it's kind of messing with my sense of time and season. You see, in Illinois, the flowers don't wake up until April or May, and the first flowers that do come up are brave little souls, as they may well get taken by a late frost. Regardless of the pretty fleurs and sunny warmth we've had, my skin has been as dry and wintery as ever. These little bars have been wonderful. I've been using them especially for my feet: putting on a bunch before I go to sleep, and wearing socks to bed. Waking up with soft feet is a pretty nice way to start the day! Before choosing my ingredients, I sifted through many recipes and tried decide which ingredients would make the least greasy bars. At first I was a little disappointed in these because they seemed quite greasy, but that goes away quickly - it sort of just melts into your skin. Now I really like them. 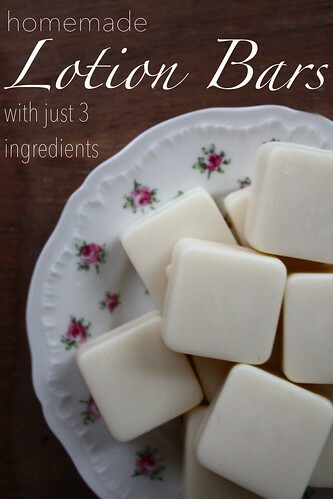 For your information, there are tons of recipes out there for lotion bars, so you can mix and match the basic ingredients. 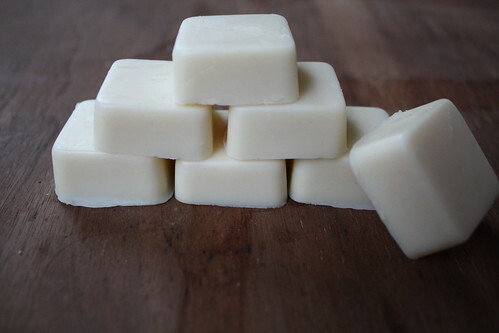 For example, you can replace grapeseed oil with almond oil, or replace coconut oil with cocoa butter or shea butter. 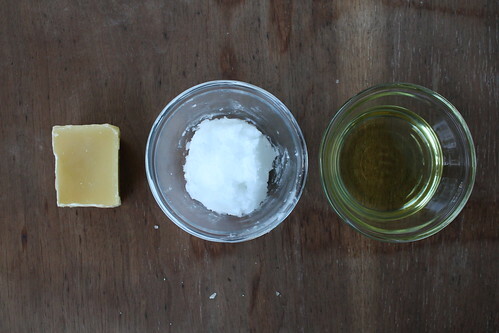 The idea is that you have a liquid oil and a solid oil with the beeswax. You can also add Essential Oils (like lavender or citrus), but I chose not to because I nanny in a scent-free home. Just melt the ingredients together, pour them into molds, and wait a few minutes for them to set! In a double broiler (or you can use the microwave), melt the beeswax. Once completely melted, add coconut oil, stirring occasionally. 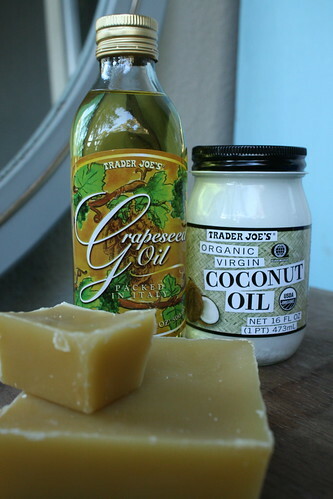 When coconut oil is melted, add grapeseed oil and stir to combine. Pour into silicon molds and allow to set. Mine only took about an hour, but I left them overnight just to be sure. Pop them out of the molds, and you're done! Two words: Comfort food. I don't know about you, but my comfort foods don't tend to make the good-for-you list. Among not-so-good-for-you Italian and Mexican foods, this soup stands out as an exception to the rule. It's not heavy, but it sure is hearty. Plus, it can easily be vegetarian. And it's delicious and warming, just like comfort food should be. This recipe came about mostly by accident. You know those recipe clippings we've all got tucked away in the back of our cookbooks with intentions to try them some day (even though they've been in there a while...)? 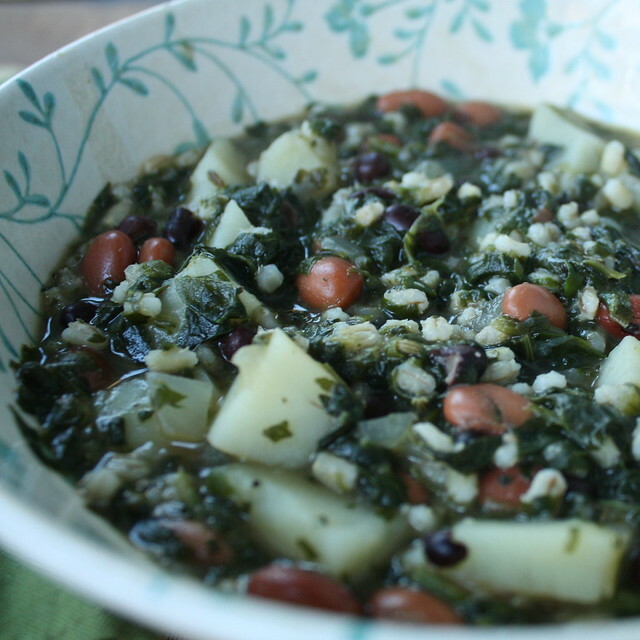 Well I've had one for spinach and white bean soup, and it made its way onto my meal plan this week. Then as I started out to make it, I ended up ditching the recipe clipping and making the soup my own. I was so happy with the way it turned out! My ingredient of the month is going to be barley, I can tell. I cooked it for the first time this week. Yes, the first time ever! We just never ate it when I was growing up, so I never really cooked with it. Now I love it. It's going in everything. In a stock pot, heat olive oil over medium heat. Sauté onion and garlic until tender. Add stock (or broth), spinach, beans, and potatoes. Bring to boiling, then reduce heat and simmer until potatoes are just tender. Stir in barley and season to taste. Simmer about 10 more minutes.